Here’s something no one ever tells you at the grocery store . . . rutabagas should actually be called “rotting licorice”. We are still continuing our real food journey and mommy decided that she would branch out and try some of those foods that you only find in the Martha Stewart magazines. And, they had them at the farmers market, so they must be good, right?! Let’s just say that there’s a reason those foods have a season span of 2 ½ months and that no one really laments when they leave. I actually tried to make a rutabaga stew because I couldn’t find anything better to do with them. I found out that the really great smell of the stew was only masking the nastiness underneath. I threw the entire dinner away and wouldn’t even let the children try it for fear that they might actually spit it at me . . . and I really couldn’t blame them. Of course, Husband from Heaven (or as we like to call him, "the human garbage disposal") ate the stew and said “it tastes fine”. I’m not sure whether it actually tasted fine to him, or he just couldn’t bear the thought of throwing out an entire crockpot of food. Probably both! 1) “Healthy Halloween Treats” is an oxymoron and should NEVER be tried at home. Your children will leave the rotting remains of whatever “treat” you made and you will find it 2 weeks later in the corner of their room somewhere. I thought this was genius . . . pears with blueberry eyes and a cornflake mouth (it was supposed to be an almond, but one of the girls in the Daisy troop has nut allergies, so I had to improvise). I even used spaghetti to keep the blueberries in place. Here's the problem - my "skull pears" were competing with 15 other snacks including Kit Kat bars, homemade chocolate chip cookies and cake pops! Rookie mistake! Another thing I thought was genius . 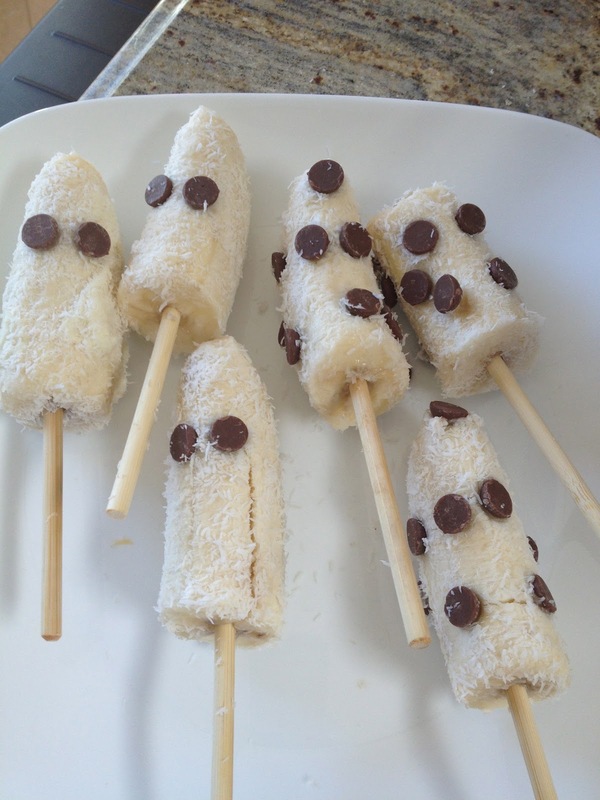 . . frozen banana coconut ghosts with chocolate chip eyes. I even tried to make some of them more appealing by making them Charlie Brown ghosts. Here's the problem(s) . 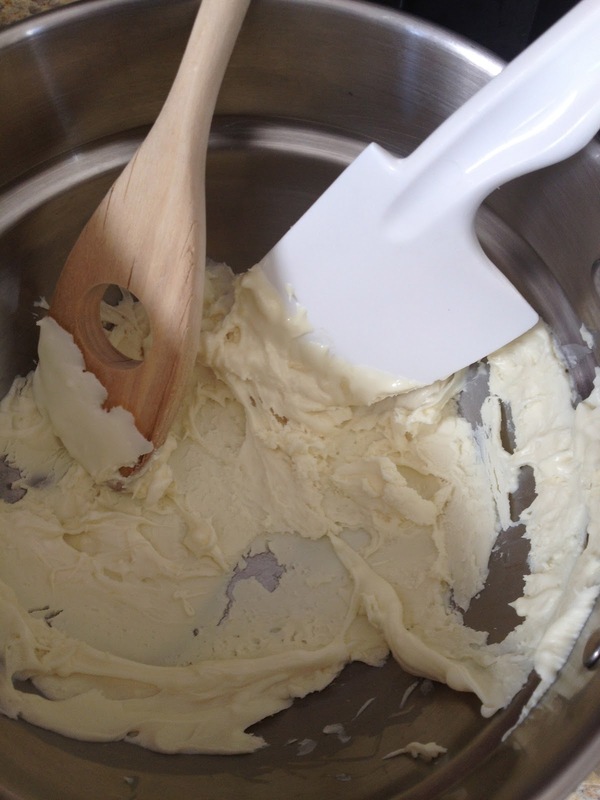 . .
white chocolate does not melt well AT ALL. That sh*t coagulated before it even left the pan. So, then it was just coconut covering them. Problem #2 . . . I made them early in the morning and then froze them. Apparently bananas that are defrosting get mushy and taste disgusting. D@MNIT! Why don't they tell you THAT in the magazines. No good mommy snack deed goes unpunished. 2) When you want to make the Frankenstein Jello molds like in the Family Fun magazine, you will find out that gelatin is not humane to animals and they do not sell it at Jimbo’s. If you are like most mommies who want to survive their childrens’ adolescence and are unwilling to give up jello shots, do not ask why it is inhumane and pretend you never read this! 3) If you would like to make something green, but want to avoid food coloring, the only way to dye your food green is to boil the crap out of some wheat grass and cross your fingers that the taste of whatever you are trying to turn green will not be impacted by the taste of something intended only for animals to eat. Oh, but it doesn’t matter because you’ve already discovered you can’t make your green jello molds anyway. 4) If your “real food journey” was a trick intended to make everyone else’s house look more inviting than yours. . . it worked and your children would much prefer to be at the house with pixie stix and pop chips. Whew, Mission Accomplished!!! Moral of the story today . . . embrace the advances of modern food technology and stop being a pain in your own @$&! Those preservatives are what keep us alive long enough to be on the Smuckers Jar!!! P.S. No, HfH, that does not mean that the diet is over. We are goldfish crackers and fruit snacks free for good . . . unless we're the snack family for the softball team. Then, all bets are off and we're buying as much red dye #5 as we can get our hands on. Thank goodness this post couldn't have come at a better time as I have found myself volunteering for nearly every party at preschool...thanks for making me laugh!!! She Rocks . . . but not today! SHHHHHHHH. . . . . .